The American Academy of Family Physicians (AAFP) Board of Directors selected David Gaus, MD, MPH, an honorary fellow in the UW Department of Family Medicine and Community Health (DFMCH) and the founder and director of Andean Health & Development (AHD) in Ecuador, as the recipient of its 2016 Humanitarian Award. The award honors extraordinary and enduring humanitarian efforts by AAFP members, both within and beyond the borders of the United States. The mission of AHD is to provide quality, sustainable health care for rural Latin America. It is based at the DFMCH, where Dr. Gaus spends part of the year. Dr. Gaus worked with Father Theodore Hesburgh, former president of the University of Notre Dame, to establish AHD in 1997. Their pilot project was a hospital in the underserved community of Pedro Vicente Maldonado. It opened in 2000 and by 2007 was financially self-sustaining. The hospital provides high-quality secondary care to an extended community of 80,000 and also serves as a training ground for physicians, nurses and other leaders in the local community. Dr. Gaus’s current project, Hesburgh Hospital in Santo Domingo, Ecuador, continues to expand the reach of AHD. The hospital opened in June 2014 and serves a community of 600,000. A quarter of that population lives on less than $4.00 a day. The hospital is expected to be financially self-sustaining within two years and will serve as a headquarters for the region’s public sector physicians. 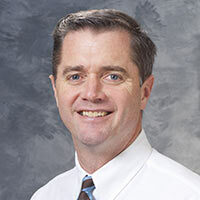 Dr. Gaus has also written numerous articles and lectured regionally, nationally, and internationally on the topic of rural health care in Latin America. He received the award at the AAFP’s 2016 annual meeting.